Based out of Northwest Missouri, Festival was a prominent group in the South Dakota music scene in the 1970’s and 80’s. 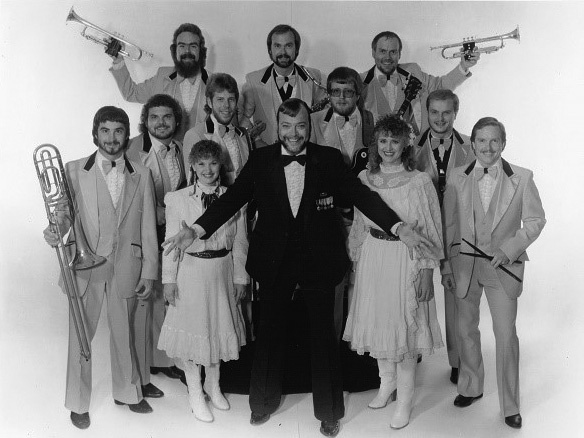 The high energy big band wowed audiences across the state in a variety of venues; nightclubs and ballrooms, high school proms, street dances, state conventions, county fairs, the Sioux Empire Fair and the South Dakota State Fair, even the Miss South Dakota USA pageant. The band featured numerous members throughout the years including several from South Dakota. Festival’s driving rhythm section and big brass sound was complimented by bandleader Britt Small’s one of a kind vocal styling and professional showmanship. Known for their versatility, they played a wide variety of music including rock and roll, rhythm and blues, country, funk and big band swing. A Festival show was more than the music; the band brought a unique style of entertainment to each performance that included comedy, dance routines and audience participation. An evening with Festival was a feel good experience that left the audience looking forward to their return.